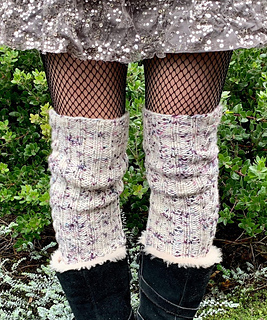 Stride forth jubilantly in these kicky leg warmers accented with simple cables, perfect for the fun-loving advanced beginner. Available in two stretchy sizes, they’ll dress up any pair of great gams. 330 yards/300 meters aran weight yarn. Size Small shown in Plushy by Blue Moon Fiber Arts, colorway Scattering Particle Parade.